During last years Sira business registered relevant improvements, in particular turnover increase, thanks to diversified activities that headed to confirm our leading position in certain business areas. Such successful results are linked to the Company capacity at setting up policies that privilege the coordination of main bodies such as finance, sales, design, technical, site jobs. 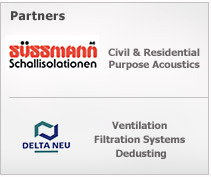 Results achieving capacity conducted to new investments which will lead to further job management processess improvement and, hopefully, will make our brand to be one of the most successful not only at noise pollution removal but also at design, construction and specialized technical support capacity excellence. Therefore, the Board is firmly willing to pursue in manteinance and implementation vision of integrated quality and environment policies, in conformity to UNI EN ISO 9001:2000 and ISO 14001:2004 standars requisitions. Sira always operated with quality improvement vision and general purpose environment respect. We believe a key action will be to set goals concerning improving environmental impacts of our activity, and that it will be necessary to start from a specific and significant goal: safeguard of non-renewable natural resources. This goal will be strictly considered throughout all company processes developing, starting from preliminary design and commercial process. These Bodies will inform Customers and register their satisfacion feedback, communicating our natural resources safeguard care, applied R&D, new material testing activities. Every job will be managed taking care about material recycling at production operations, for both purchased and utilized materials. Sira is pre-arranging to achieve described objectives not later than 2012. Sira objectives are pursued respecting outlined steps that will lead to remove obsolete or inappropriate materials from manufacturing processes and to use certain reworked wastes. Our new manufacturing plant will offer wider spaces, suitable to create laboratory areas where transmission loss and noise absorption tests - into ISO standard normalized ambients - will be performed. o Acoustic efficiency of soundproofing systems will be laboratory-tested and certified; this feature, in particular, will represent a differentiation point with competitors. Moreover, it will be opportune to carry out more research activities into complex and specific products where testing is critical, i.e. anechoic and semi anechoich chambers. These products will be the way to affirm our knowledge through deeper instrumentation and European requisitions specializing. Sira will keep setting up more training and upgrade courses, in order to support and improve his technical and commercial staff.